The Beasts of Tuamgraney is a story that takes place in a wooded area just outside the town of Tuamgraney in County Clare during Halloween, also known as Samhain. This tale of terror could be seen as a person witnessing a battle between good and evil or a simple warning to Irish travellers to beware of where they choose to wander. Around Halloween the residents of Tuamgraney avoid a certain wooded hollow and with good reason. A young man, either forgetting the stories or being very sceptical, decided as it was a beautiful autumn day to go for a walk in these woods. As he wandered in among the trees a strange sensation came over him a mixed feeling of fear and immense sadness. He decided as he was carrying a stout stick that he would forge forward. Unable to rid himself of this feeling he almost turned back when he noticed that the trees seemed thicker and he could not find the path home. His imagination started to run wild with images of Pagan times of cruel bloody sacrifices and rituals, stopping still he felt the omnipotent silence surround him. Gone was the beautiful autumn day. Not a ray of sunshine could break through the suffocating trees nor could he hear the birds singing to one another. Suddenly movement in the bushes caught his eye seeing a huge black dog he thought that it must be a stay wandering far from home until it turned to face him. The dog stared at him with large glowing red eyes before disappearing. Turning round the man’s heart nearly took flight when a large Irish hare jumped in front of him an expression of malevolence equal to the dogs glared out of its evil red eyes. It too bounded off amongst the dense dark foliage. Fear now coursed through the man’s veins as a cat leapt into view its coat like freshly spun straw its back ached, fangs barred it hissed as its red eyes brimming with malice starred straight at the man before it retreated silently into the shadows. Terrified beyond reason the man would have fled back the way he had came but the ground seemed to spin and rise so he ran blindly forward though the ever enclosing trees. Stopping abruptly he realised he was in a clearing and with the coming dusk it appeared darker than the forest had been but through the murkiness he could see two figures. One a black ram with evil red eyes and enormous razor sharp horns, the other an ordinary deer hind. They appeared to be caught in a struggle, a battle for life and death. Wounded and battle weary the hind fell to its knees, it looked towards the man a cry for help in its tear stained eyes. The man suddenly felt courage replace the fear in his heart so screaming and brandishing his stick he rushed the ram in an attempt to beat it away. His blows met with nothing but air as the ram seemed to be made of mist but when in turn the ram buffeted the man he too fell to the ground winded and in pain he momentarily blacked out. Coming to the man found the scene deserted and the trees not so dense he felt as though he had imagined the whole event but as he got to his feet he realised that the pain he endured in the fight was real enough. 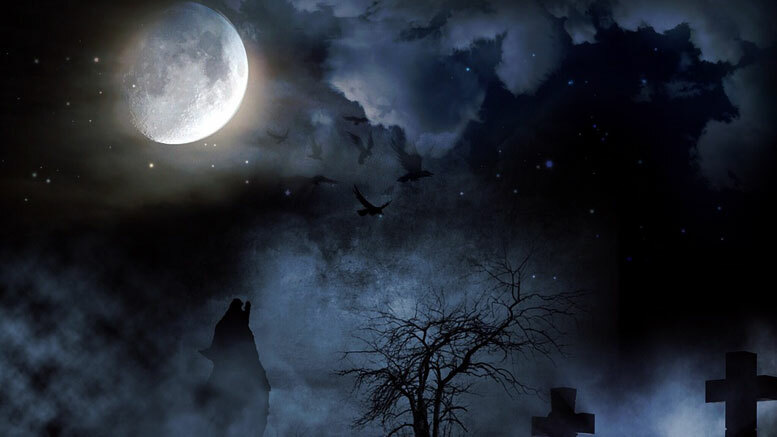 Wearily making it home he retold the whole story as though it were a dream until an old uncle confirmed that others too had stumbled into the beasts of Tuamgraney forest making it a place to avoid certainly around Halloween.